The average annual temperature in the state of Alabama is 64 degrees Fahrenheit. And like most states below the Mason-Dixon Line, its climate is classified as humid subtropical. This weather makes it one of the warmest states in the U.S. (excluding Hawaii), which means it gets plenty of sunshine year-round. This makes the state perfect for usage of solar panels. Of its own accord, Alabama Power has answered the call for clean energy. It’s now providing solar panel options to supplement regular electricity in response to consumer demand. In July 2015, they requested approval from the Alabama Public Service Commission for 500 megawatts of renewable energy over the course of the next decade. Unfortunately, the state legislature has been slow to respond to the growing need for renewable energy. For both residential and commercial installations, it offers some of the lowest incentives in the country. Still, there are leasing options available, and there are federal incentives, including energy savings to offset the costs of installations. There is also the expected decline in the cost of photovoltaic cells (i.e., solar cells), which are unaffected by local actions. It can be a challenge to navigate the options of Alabama’s solar panel acquisition options. The rest of this article will clarify the pros and cons of each option, and it will provide further clarity about which one fits your budget. 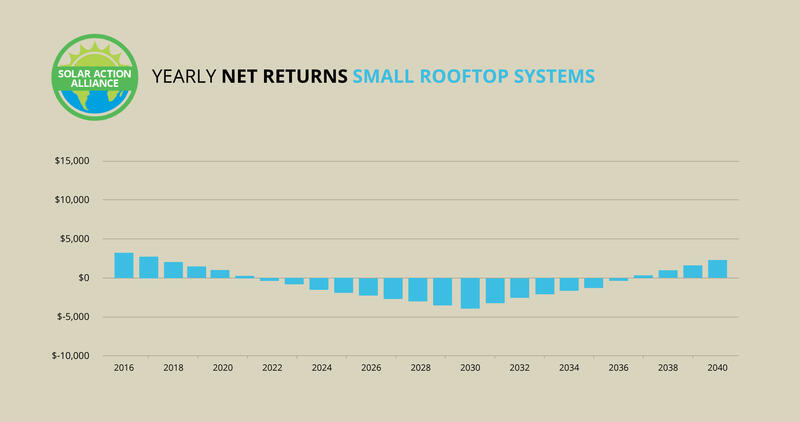 The chart below illustrates the return-on-investment for solar panel systems in Alabama over the course of a 25-year period, which is the expected lifespan of such a system. What stands out is the lack of a leasing options in Alabama, which has been replaced in the graph by an estimate for a small system. 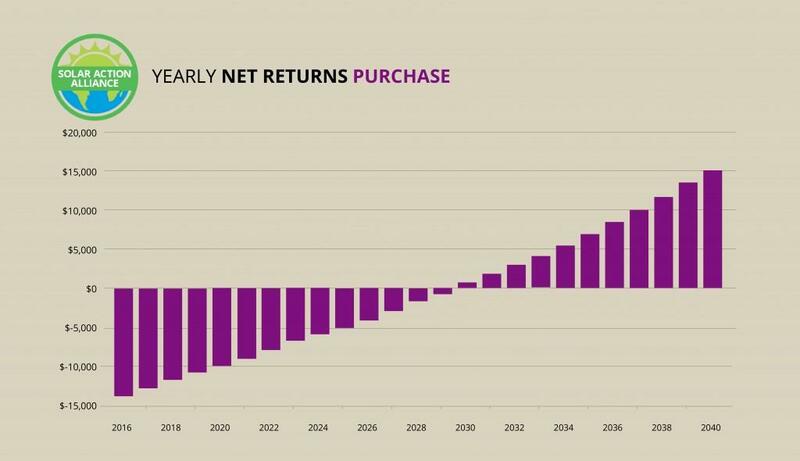 The cost of an outright purchase of a solar panel is relatively high; it sees a complete turnaround after about 15 years. The more feasible option is a buy+credit/loan, as it has the least amount of risk. While there is more cost than savings during the initial 10-15 years (because of high loan payments), the loan route is still eligible for federal tax credits. 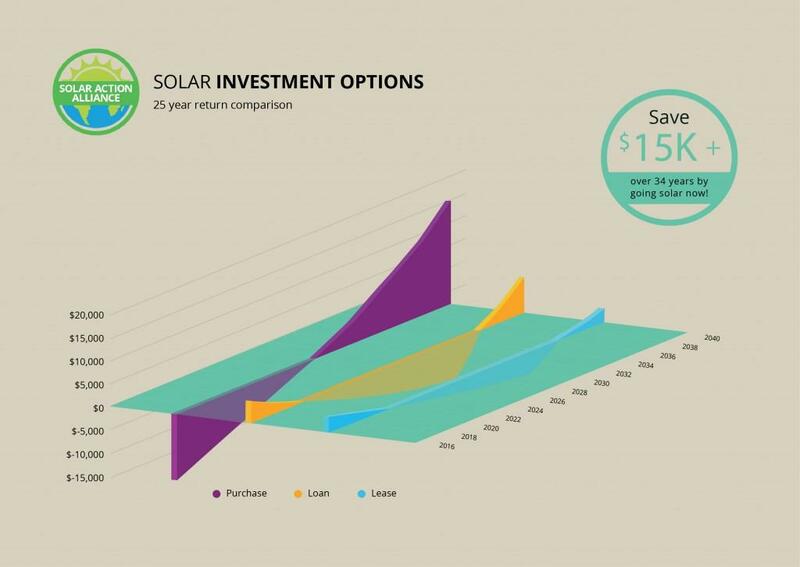 As the graph below illustrates, buying solar in Alabama is a costlier endeavor than in most other states. But this cost isn’t necessarily prohibitive when long-term savings are considered. The federal government offsets the lack of local incentives for solar panels; the federal credit is calculated according to out-of-pocket costs. For instance, a 30% federal credit on a $20,000 system for 5-kW comes to about $6,000, which brings the actual cost down to $14,000. First-year savings will deplete another $750, based on the cost of electricity in the state. So the initial hit on your wallet comes to around $13,250. At this rate of savings, the cost of your solar panel system would pay for itself off in around 16 years, which is slightly longer than it would take to pay off a loan. This line of credit is the most feasible option for acquiring solar power in Alabama. And federal returns on this method still apply. So if you’re home equity is enough to secure a 0-down payment, the recoup can be used to pay back a portion of the loan, as well as lower payments. The downside is that payments will initially exceed savings by about $100 for most of the repayment period. The upside is that your savings will be over $1,200 for the remainder of the 25-year lifespan of the system—after the loan is payed off. 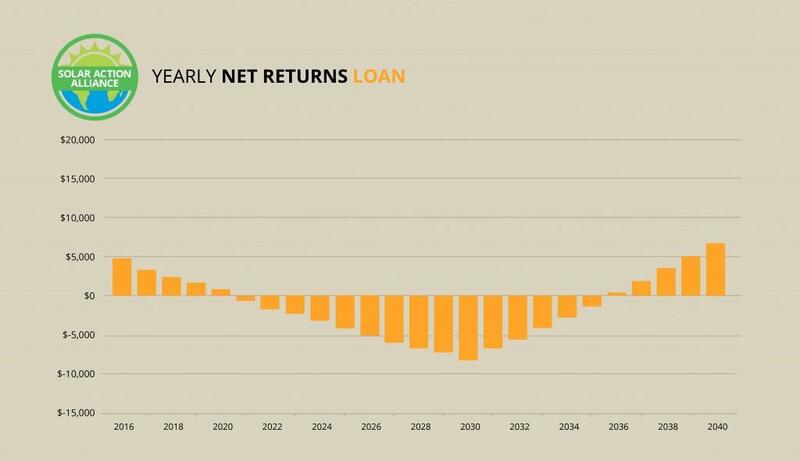 The smartest way to keep loan payments down during the middle years of the term would be to have the $6,000 tax credit split over the first couple years, then use this money to pay back the loan. You’ll pay out-of-pocket for the first year, but after the federal rebate kicks in, you’ll have an extra $4,800 left over to pay for the next 2-3 years. A normal solar system installation runs about 5-kW, so a small system runs slightly less than half that: about 2-kW. Financing to acquire this system works the you would expect to; you pay slightly less than half the price for slightly less than half the power. Specifically, a system that normally costs $20,000 would cost $9,000. In year one, applying the same 30% federal incentive would add up to $2,700 in savings. It is also feasible to acquire this system through the aforementioned HELOC loan, assuming you have some home equity to use as collateral. It works the same way as an outright purchase; the lesser loan payments are offset by lower savings. 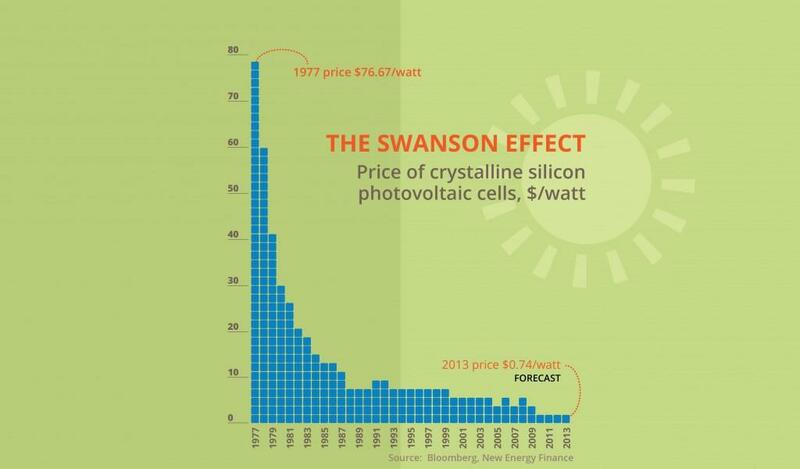 In the first 15 years of ownership, you’d end up paying about $20 per month for power. After year 15, when the loan is paid off, the savings will increase, along with the increasing cost of electricity. 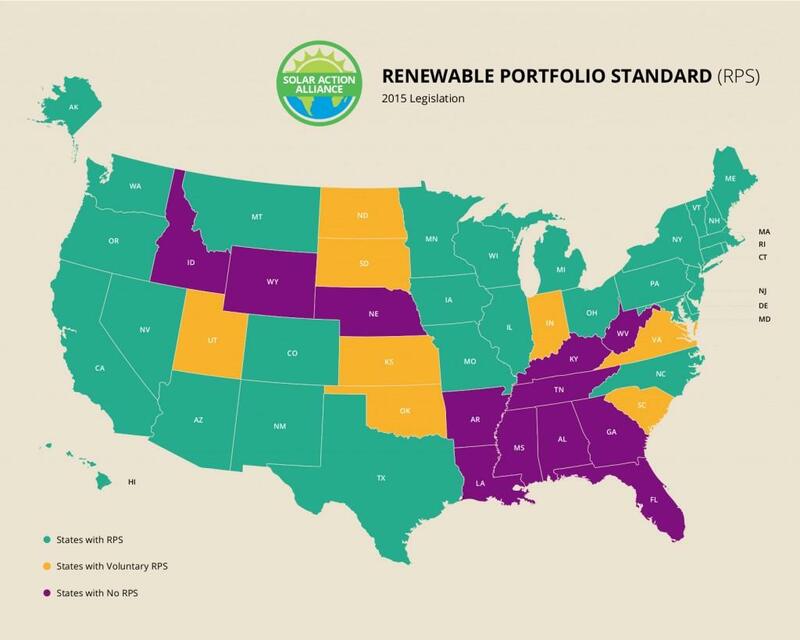 A Renewable Portfolio Standard is a regulation that requires states to increase their renewable energy by a certain amount over a certain period of time. Utility companies that fail to meet these requirements are subject to penalties, which usually exceed the cost of compliance. Like many of the warmest, most rural states, Alabama’s RPS is less aggressive than those that receive less sunshine. This may be the result of state government entities operating on the assumption that more sunshine equals less attention to renewable resources than necessary. As such, Alabama finds itself without these standards, leaving it without state incentives for increased solar production. 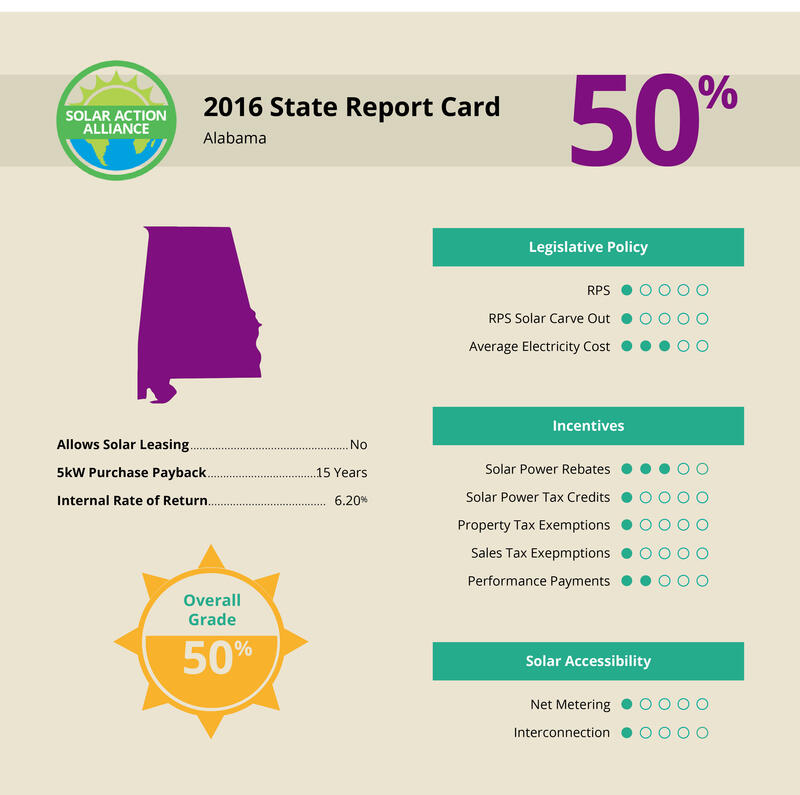 Because of Alabama’s high annual temperatures, it may come as a surprise that it is ranked 42nd out of the 50 states in overall solar utility. It falls below average in RPS, solar carve-outs, net metering, and tax exemptions. This may be because Alabama focuses its renewable efforts on methods other than solar. It is one of the preeminent producers of hydroelectric (i.e., derived from water) power in the southeast, and it also has a strong backing for biomass and waste energy. 2013 saw 3,280-MW of hydroelectric energy, and approximately 720-MW of biomass and waste energy—compared to a paltry 1.1-MW of energy generated from solar panels. A lack of net-metering and interconnection standards puts the Heart of Dixie among the lowest-rated states for solar power. But the hope is that the push from utility giants can galvanize state entities to be in favor of going solar in the coming years.